Ask our regular visitors what they love most about Chopwell Wood and you can be fairly sure the sculptures will get a mention. One of the most iconic is The Hands by David Gross. These are actually The ‘New’ Hands because they replaced the first ever sculpture in the Wood, carved from poplar, which had become rotten after 12 years in situ. 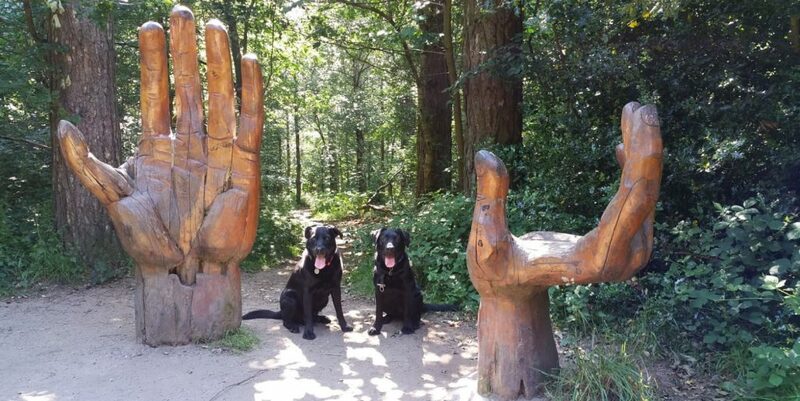 So, in 2006 David recreated The Hands in oak, making one of the outstanding landmarks in Chopwell Wood and a popular photo-opportunity for visitors. Our volunteers work with the Forestry England to keep the sculptures in tip-top condition, but sometimes removal is the only option. When the Millennium Oak Leaf by David Gross was taken out in September 2016 it was clear how fond people were of it, but in 2017 the Friends commissioned a new sculpture, the Green Man by Tommy Craggs, to mark our 25th Anniversary. This has become a new favourite and you can see it for yourself at the end of the Tree Trail, not far from the main car park. The Friends are involved in researching the Wood’s history and heritage and bringing it to life. Chopwell has a rich industrial history in mining and timber production. It is now a community woodland with Woodland Park status and is designated as a Plantation on an Ancient Woodland Site (PAWS). Chopwell Wood has been managed by the Forestry Commission (now Forestry England) since 1919. Our book ‘Chopwell Wood – Past & Present’ is available to members for just £1 (£2 to non-members) plus £1 P&P. If you would like to order a copy then please drop us a line at info@friendsofchopwellwood.org.uk Alternatively, you can now also buy the book from the Land of Oak & Iron Heritage Centre, at Winlaton Mill. Along with Groundwork North East and the Forestry England we have researched the story of the North East’s Lumber Jills. To find out more about the role of these amazing women in Chopwell Wood during the war, visit http://lumberjills.org. If you’d like a copy of our Lumber Jills history booklet please get in touch with us.